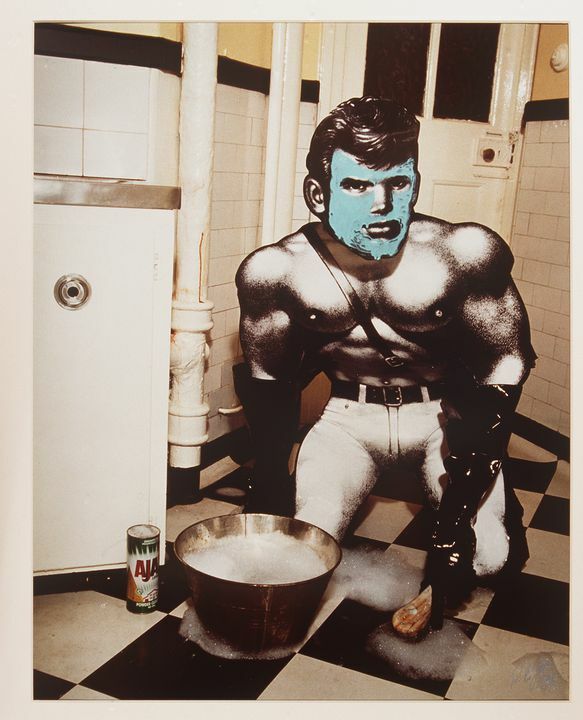 Cibachrome print titled 'Brenton in "Tom" ', being a photograph of Brenton Heath-Kerr in the "Tom" costume he made for and wore at the Sydney Gay and Lesbian Mardi Gras in 1992, the photographic set, art directed by Sydney designer Brendon Williamson, shows "Tom" in a domestic environment cleaning the kitchen floor in a face-pack, photographed by Peter Elfes in 1992, cibachrome print by the Australian Imaging Group, Fitzroy Street, Surry Hills, Sydney 1995. Costume designed by Brenton Heath-Kerr in 1992, photographic set designed by Brendon Williamson (information from the photographer). Photograph by Peter Elfes. Born Darlinghurst, 1961. Father was a photo-journalist. Diploma of Photography, Sydney Technical College, 1983. Worked Freeman Studios, 1981-1991. To NY 1991. Returned to Sydney. Worked for the Sydney Star Observer. Specializes in special event photography eg Mardi Gras, Sleaze Balls, rock concerts etc. Work represented in 'Art in the Age of AIDS' exhibition, National Gallery of Australia 1994/1995. Solo exhibition Holdsworth Contemporary Gallery, 1988. Costume designed in 1992, photographed by Peter Elfes in 1992, cibachrome print produced from the original transparency in 1996. This print was produced for the Powerhouse Museum's 'Absolutely Mardi Gras Exhibition', 1996. The image has been produced as a postcard in 1992 (94/111/2-14/15) and illustrated in 'BRENTON the man in the irony mask', Paul Hayes, OUTRAGE, July 1993.